Zappos, the online merchant best known for shoes, is following a radical self-management system called Holacracy. The goal of Holacracy is to create a dynamic workplace where everyone has a voice and bureaucracy doesn’t stifle innovation. So, the traditional corporate hierarchy is gone. Managers no longer exist! “The company’s 1,500 employees define their own jobs. Anyone can set the agenda for a meeting. To prevent anarchy, processes are strictly enforced” (NYT, 7-17-15). Tony Hsieh, 41, runs Zappos and is insisting that the company adopt Holacracy. His youthful work force displays tattoos and a casual dress code. Stuffed animals and sound-emitting sculptures (designed by the Blue Man Group) line the walls. 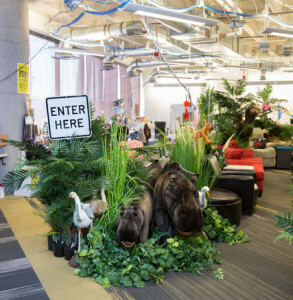 The corporate charter motto is “Create fun and a little weirdness.” Many companies have adopted “fun” work environments. But NO MANAGERS– this is more than “a little weird”– this is a super bold move! However, others say the ever-expanding number of circles and the endless meetings are a drain on productivity. “Priorities are shifting, and no one, not even Mr. Hsieh, is sure how to pay people at a company with no job titles and fluid roles.” Still Mr Hsieh is adamant about trying this approach; he is antithetical. He works for just $36,000 a year and forgoes stock options “in exchange for the autonomy to run Zappos however he sees fit.” He gave his employees a radical choice, embrace Holacracy or accept a buyout. What do you think about this organizational approach? Any hope for it working? I say hooray for Mr. Hsieh creatively experimenting with a “manager-not” work force. Since when has business deemed it inappropriate to experiment with organizational structure? Why such fear? His company is still operating… likely this grand experiment will lead to some mighty profitable learning. My guess is the end result will be a fluid entrepreneurial “hybrid” organizational model. Yes, modification will be necessary. Isn’t that what learning is all about? May the “force” of the creative work force be with you– and Mr. Hsieh– always! Thank you for reading my post. I am an organizational and business consultant living in the mountains of Santa Fe, New Mexico. My core message of everyone is creative resonates with people of all ages and walks of life. I invite all to become the best version of themselves and find true meaning by pursing long term creative quests. This entry was posted in Uncategorized and tagged creativity, fun, innovation, leadership, organizations, wierdness, zappos on December 3, 2015 by admin.